Detailed word for word commentary in Sanskrit and English translation of the same. 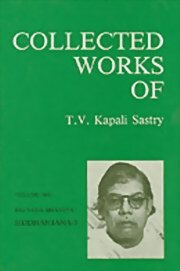 Sanskrit Writings Hymns in Sanskrit with commentaries and translations - Prayers, Sidelights in Sanskrit Literature, Sat Darshana Bhashya, Sri Ramana Gita Prakasha, Savitri, etc. Indices (free with full set of 11 volumes) Individual volumes are available.